Nearly 45 years ago, an electric bass player for a band known for its American West Coast style, walked into the Cecil Sharp House Library. Looking back, it could be said that his arrival there was one of the most fortuitous events in the modern history of traditional music in this country. Listing an honoree’s accomplishments can be a tedious business, a scroll down worthy events that blur in their repetitive similarity. But not so for the recipient tonight of the EFDSS Gold Badge, that bass player - Ashley Hutchings. Let’s start with the bands he created. 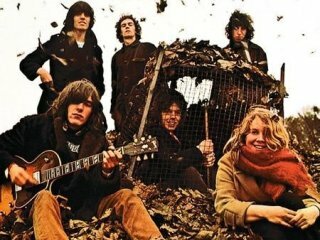 In 1967, he was part of the founding core of Fairport Convention, a band that, two years later, was searching for a new path in the wake of a tragic car crash. With Ashley taking the lead, Fairport created Liege and Lief, an album which has been hailed as the most influential folk album of all time, opening up the world of traditional music to an entirely new audience and to this day, setting a very high bar for any musicians wishing to enliven rock music or folk music by combining elements of the two. Ashley’s immersion course in British traditional music set him on a path that eventually led out of Fairport and into a collaboration with Martin Carthy and Maddy Prior called Steeleye Span. Footnote here – are there any more enduring insititutions in the world of English folk music than Fairport and Steeleye or any rituals beloved by so many as Fairport’s Cropredy Festival every August? It was another visit to the EFDSS library that drove Ashley into his next phase. When he arrived at Cecil Sharp House that day, he overhead an old recording by William Kimber. By the time he left that afternoon, Ashley’s career had taken a new direction – from the “British” traditions that had formed the basis of Fairport’s and Steeleye’s repertoires, to the strictly “English” music that would form the basis of the rest of his life’s work. From that revelation emerged the immortal Morris On album and the ever-evolving lineups and incarnations of the Albion Band. And he quickly found yet another outlet for his talents and his new enthusiasms. Bill Bryden was creating a body of very English drama at the National Theatre and Ashley brought to The Mysteries, The World Turned Upside Down and Larkrise to Candleford the music that transformed those productions from worthy exercises in historical drama to unforgettable evenings of theatrical magic. I was very fortunate to witness all those plays as well as a special evening that would mark the start of yet another string to Ashley’s bow, those projects that blend musical tradition, story-telling and history in his own signature fashion. The evening was called The Compleat Dancing Master and included recitations by such luminaries as Michael Horden and Michael Gough and comprised an unforgettable journey through the history of English dancing, both rural and urban. Twangin & Traddin, a record that reimagined traditional dance tunes as rock n roll and vice versa – Horse’s Brawl a la Eddie Cochran and Telstar as a Galliard. An Evening with Cecil Sharp and Ashley Hutchings – arriving on a bike, Ashley spent a couple of hours in the guise of Sharp, describing his life and career and playing old cylinder recordings. Street Cries – an album on which Ashley updated some of the best known English folk songs including songs created as part of his “Public Domain” project that encouraged schoolchildren to work with traditional material to develop their own original songs. These last two projects pointed the way to one of the most important aspects of Ashley’s career, his school workshops that introduce students to folk song and dance. But we mustn’t forget that Ashley is a consummate professional, a wonderfully original and skilful bass player, a musician’s musician, whose vision has been realized not only in theatre and schoolroom, but also on the indelible recordings he has created. With Fairport and Steeleye, he helped create perfect settings for two of England’s greatest singers, Sandy Denny and Maddy Prior. With the Albion Band, he provided the foundation for some of John Tams and Shirley Collins most memorable performances. An argument could be made for Shirley’s album with the Albion Band, No Roses, to stand with the better-known Liege and Lief as the benchmark for modern settings of traditional music. But we can’t conclude without touching on yet another crowning achievement of Ashley’s career. A few years ago, I attended a weekend at the South Bank celebrating Morris Dance. There were teams from all over the country including the all-girl Belles of London, David Owen’s brilliantly witty graphics, and crowded workshops in every direction. Morris Dance was, finally and amazingly, hip! At the core of the weekend was a concert tribute to the recording that made it all possible, Ashley’s Morris On. It was great to hear young musicians rendering those immortal tracks in their own style, but nothing will ever top the brilliant original. If forty five years ago, someone had predicted that a rock bass player would almost single-handedly transform the image of Morris dance in this country and provide so many of the sparks that have led to a tectonic shift in the way England looks at its own musical traditions, they would have been called crazy. Call me crazy, but having known Ashley for 47 years, having been the beneficiary of his acute ears in tipping me to the music of Nick Drake, as well having enjoyed many collaborations with him over the years, I have to say that nothing he accomplishes surprises me. And I think the EFDSS has learned that in Ashley Hutchings English folk music possesses a treasure and a more than worthy recipient of their Gold Badge Award. Ladies and Gentlemen – Ashley Hutchings. 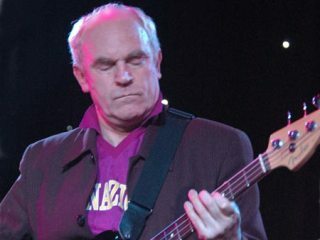 Photo Credits: (1) Ashley Hutchings, (2) Fairport Convention (unknown/from websites).